waves, while ideally simple in theory, necessitates in practice an elaborate and complicated piece of apparatus for its realization. 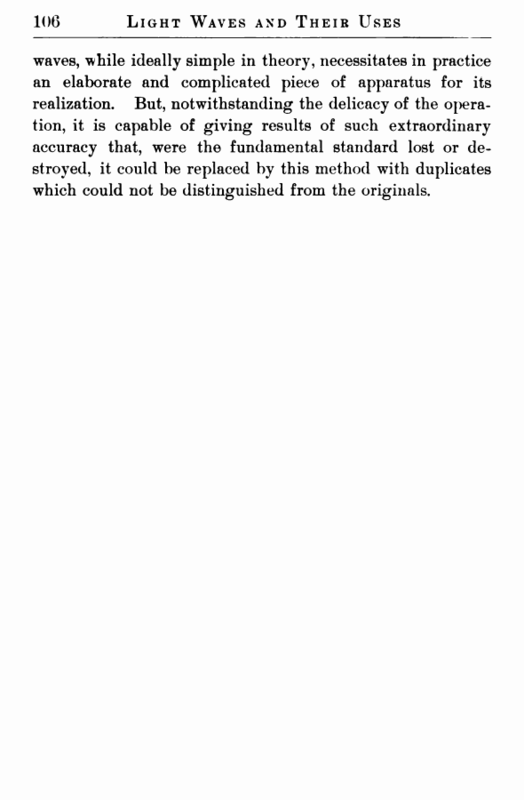 But, notwithstanding the delicacy of the operation, it is capable of giving results of such extraordinary accuracy that, were the fundamental standard lost or destroyed, it could be replaced by this method with duplicates which could not be distinguished from the originals. 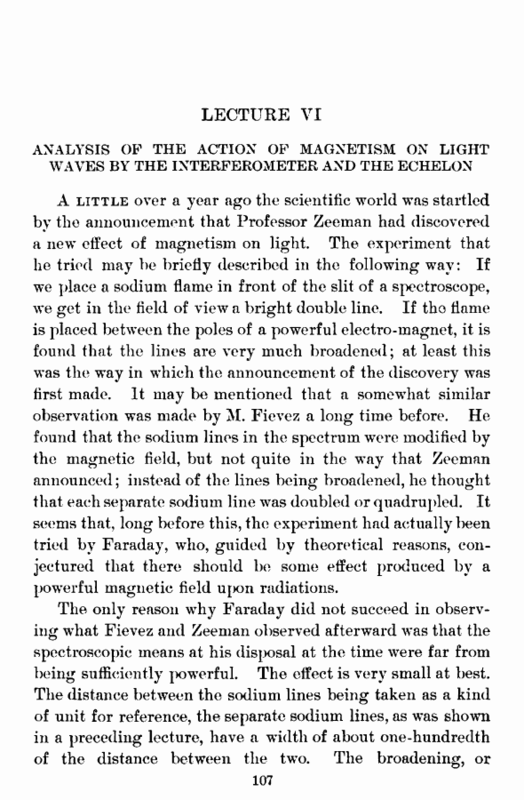 A little over a year ago the scientific world was startled by the announcement that Professor Zeeman had discovered a new effect of magnetism on light. The experiment that he tried may be briefly described in the following way: If we place a sodium flame in front of the slit of a spectroscope, we get in the field of view a bright double line. If tho flame is placed between the poles of a powerful electro-magnet, it is found that the lines are very much broadened; at least this was the way in which the announcement of the discovery was first made. It may be mentioned that a somewhat similar observation was made by M. Fievez a long time before. He found that the sodium lines in the spectrum were modified by the magnetic field, but not quite in the way that Zeeman announced; instead of the lines being broadened, he thought that each separate sodium line was doubled or quadrupled. It seems that, long before this, the experiment had actually been tried by Faraday, who, guided by theoretical reasons, conjectured that there should be some effect produced by a powerful magnetic field upon radiations.